In this Polaris Bike Pod review, we’ll take a look at the Polaris and OEM bike pods. I’ve chosen to combine a Polaris Bike Pod Review and OEM Bike Pod Review into one single review as they’re typically very, very similar. In fact, from what I have seen, OEM pods are basically a copy of the Polaris, so combining them into one review makes sense. I’ve also owned both, and travelled with both, so am well placed to comment on them. You can check out my article detailing how to pack your bike in the Polaris or OEM bike pods. Where they differ markedly, I will highlight the differences. Before we dive into the pods, I want to quickly mention what I look for in a bike bag. All of these things, except price, contribute to the overall utility of the bag. Click through each item to skip through to that section. This bag was not made for agility in the same manner as the Scicon Aero Comfort Plus. There is on the front about 2/3rds of the way up, so it’s reasonably simple to pick the bag up at the front and wheel it along. There are no looped handles on the top, just these dicky moulded handles which serve no useful purpose. 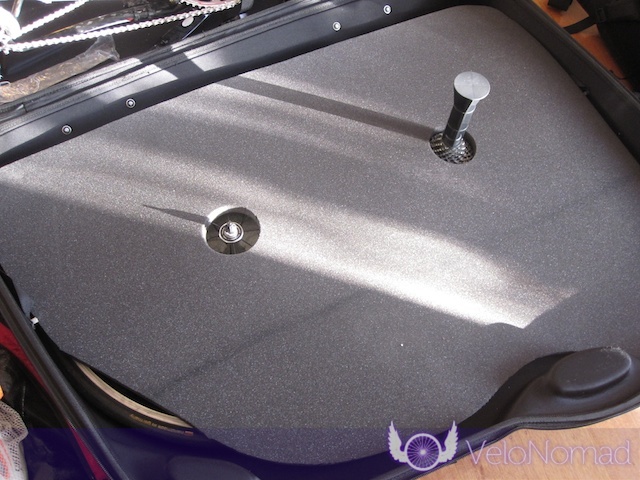 There are no castors on the front, unlike the Polaris Bike Pod Pro or Scicon Aero Comfort Plus. I can’t overstate how much more convenient bags are to wheel around when they have front castors and you don’t have to keep bending down and picking them up to move them. This is especially true around airports. You will need to take your handlebars and pedals off. Your seat can stay on, but will need to be pushed right down, or removed. You don’t have to take the rear derailleur off. Whilst it is undoubtably inconvenient taking your handlebars and pedals off, it is a small tradeoff for protection for the bike. The pod is a clamshell design so you can easily pack your bike in on the ground – bike on one side, wheels on the other. This bag is not stable at all due to a fairly narrow wheelbase. In my travels with this bag, it continually fell over as the feet it rested on were not even. The OEM bike pod I owned was slightly wider but suffered the same problem. By virtue of the pods design, it scores poorly in the compactibility stakes. As it’s a moulded EVA bag, you cannot fold it up, so if you’re travelling in a campervan or car, make sure you budget for the space this will take up. If you hole up in a hotel room or some other digs, you should be fine. The moulded EVA is quite light – 6.7kg claimed (which is about right according to my records). The OEM bike pods are a touch heavier – around 9kg. The bag itself isn’t huge – it’s about the same size as the Chain Reaction Cycles Bike Bag (check out my Chain Reaction Cycles Bike Bag review) and smaller than a fully loaded EVOC. The limited size is good in a way, as it will force you to minimise luggage. Dimensions are: Length 1200mm, Height (tallest)907mm, Depth 280mm. Due to the bike pods’ inherent design, it is really robust. The only way the EVA exterior will be perforated would be via a hard impact with a pointed implement. The zips are really robust. The wheels are recessed but are probably the weakest point on the bag in terms of how they’re attached and their general quality. There are plastic rails on the base which don’t really have any use as the wheels and rubber/plastic stoppers on the front keep them off the ground. I think one of the biggest selling points of this bag is the protection it offers your bike. If you pack your bike as I describe in my how to pack your bike in the Polaris or OEM bike pods article, you pretty much can be assured your bike will arrive in mint condition. The wheels are attached on the other side of the bag, and secured with quick release (QR) skewers – not supplied. I recommend getting some cheap QR skewers. Actually, this design is a little flawed as it relies on the QR nut not becoming undone. I’d add some duct tape over the top of the nuts on the outside of the bag. In the image below you’ll notice some plastic braces which brace the walls of the pod against each other, in order to prevent the wheels being banged on the frame when the bag has weight on it when lying on its side. 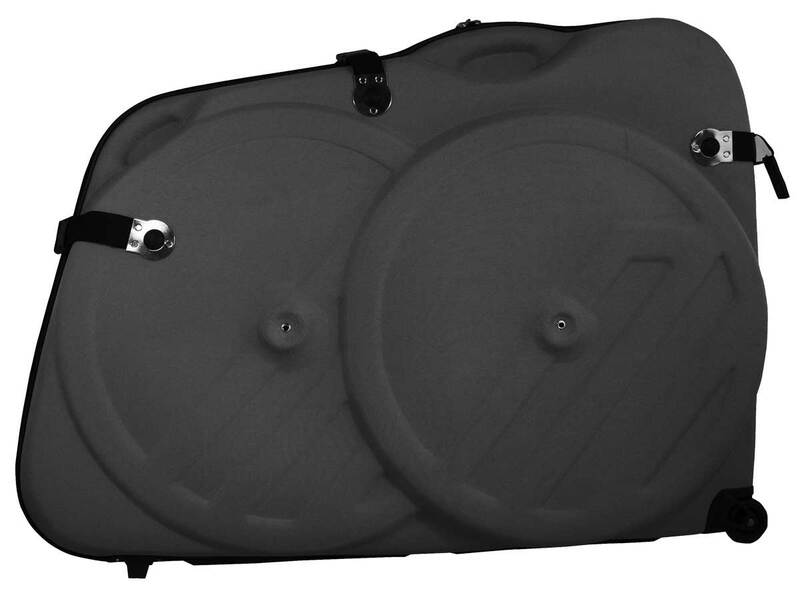 The Polaris Bike Pods do not ship with these, so you will need padding to pack out the pod. I’d also put some foam, bubble wrap or other protection – an old sheet would do – over the wheels to protect your bike frame. The obligatory padding should be used around crankset, chainstays, rear derailleur (which could be removed for extra safety) and other sensitive areas. 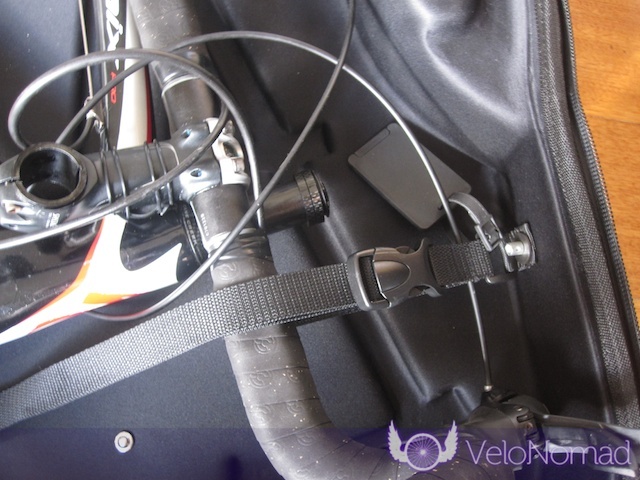 Given the bag is moulded, there’s no real ability to adjust the bag – you’ll just have to measure your bike according to the pod dimensions (read above) and make sure it fits. 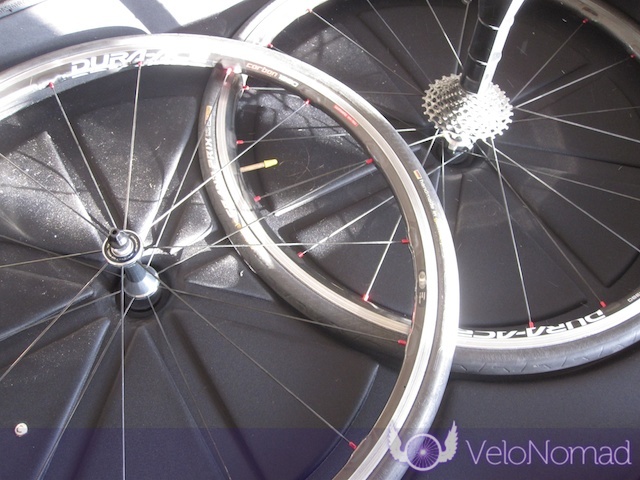 You could put your wheels against your frame for a quick check. I think the pods are for road bikes only, and you’d probably struggle to get an Integrated Seat Post (ISP) bike frame in. There is adequate space for your shoes, kit, some tools and more. In 2010, I put all my tools, nutrition for Etape, kit, cycling shoes and some other stuff in here. The major straps are long, so you’ll be able to wrap around your frame at certain points. This bag is great if you don’t need to do a lot of moving around and carrying it around (trains, buses, lots of airport transits). If you just need something to get your bike from A to B, then this does the job. Overall, the bike pods do the job they are intended to do, and do it well. For those doing a lot of transits, or travelling by train or bus, this bag might not be the best solution for you. Check out the Scicon Aero Comfort Plus as a worthy alternative. If you are travelling around in a campervan or car, you’ll need to account for the space this takes up (or leave it at the campervan depot). There are a few things that would improve the bike pods, such as the addition of some castors on the front and some more straps. I don’t think you’ll be disappointed with the Polaris or OEM bike pods as your bike travel bag solution, but I think there are better alternatives out there, such as the EVOC Bike Travel Bag, Chain Reactions Bike Bag or the Scicon Aero Comfort Plus. Expect to pay anywhere between AUD$320 and AUD$412 for the Polaris Bike Pod. Be aware, shipping from the UK (Chain Reaction) is really expensive at AUD$297 (correct at June 2012) – this almost doubles the cost of the bag. 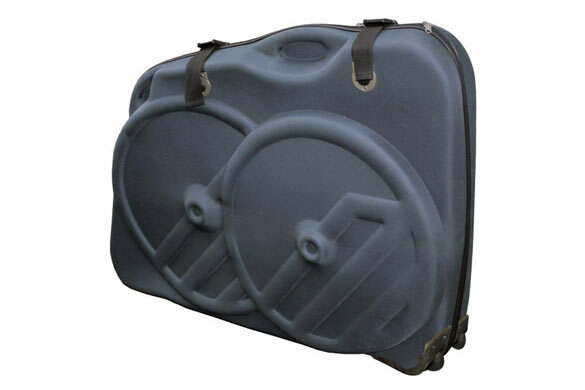 By way of comparison, the EVOC bike bag ships free to Australia. For OEM (no name) copies, expect to pay around AUD$200. You can get the Polaris Bike Pod from Chain Reaction Cycles. OEM bike pods are basically copies and are available on ebay and from other online stores. 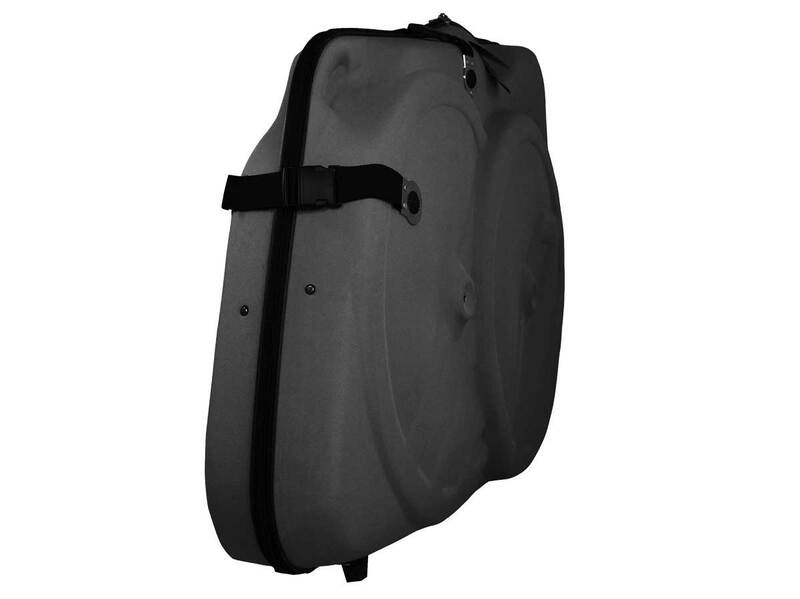 Check out the VeloNomad product review page for more bike bag reviews. A significant amount of time and effort goes into these reviews, all with the aim of helping you. As lots of readers say, I give way too much information away for nothing, and it really does take a lot of time and effort (but I do love doing it!). If you found the site useful, and you didn’t need a SIM card or ebook, I’d really appreciate it if you dropped something in the Paypal tip jar below. Or if you’re buying something online, use one of the affiliate links below the Paypal button. These affiliate links provide me a small commission (2-4%) on each sale and they don’t cost you a cent extra. Tim is an ex Melbournite now living near Byron Bay on 10 acres, happily growing mangos, avocados and lots of other stuff, with his wife Kate, son Arthur and adorable Golden Retriever, Whiskey (RIP our 1YO G/R Poppins :( ). I bought a Polaris Bike Pod for my trip to France last year. Chose it over other options as it offered the protection of a hard case without the weight. I used slit pipe lagging and reuseable cable ties to protect the bike and bubblewrap sleeves for the wheels. Plus removed the rear derailleur and cable tied it to the frame. The top straps suspending the bike loosened both directions meant the bike was resting on the bottom of the case, so was glad I did this. Walking distances with this case is its biggest negative. The molded handle is useless! Ended up loosening the front strap slightly and holding this to wheel it longer distances, including over rough pavement to my accommodation. Bike did the journey without any damage, which given how baggage handlers treat bike cases says something of the protection provided. 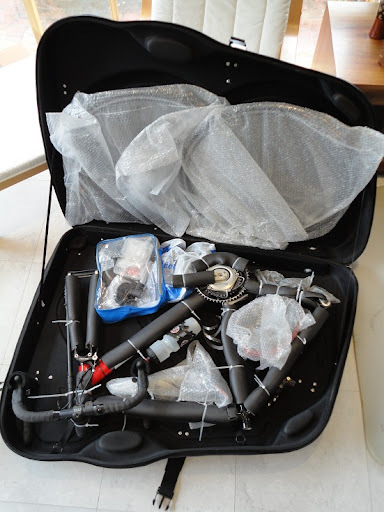 Photo of the bike packed. This is great feedback, and insight. You are right, the pod protects bikes in transit, but is terrible for getting around. The moulded handles are shocking. The “pod” appeals to me as it seems to offer the best protection for the cost. 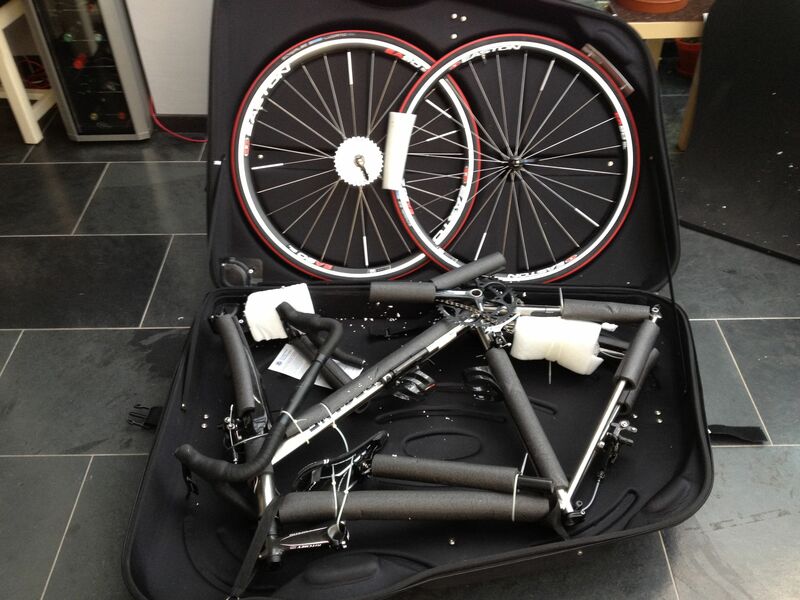 I’ve taken bikes on planes before without problems (disassembled in cardboard bike boxes) but my new bike is more expensive and I’d be right p*ssed off if it arrived bent. 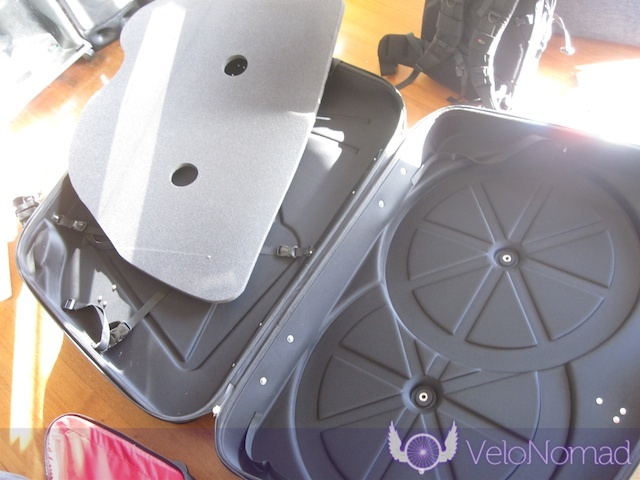 The EVA pods seem to offer more “crush” resistance than the softer bike bags, at 1/3rd the cost of the more rigid cases (which also appear to suffer more impact damage in transit). Although I don’t have the case yet, I would consider adding some styrofoam blocks to bridge the inside gaps between sides and provide some cheap additional crush resistance. It looks like your photos show a plastic strut added along one of the wheel axles – is that a good idea? It would transfer crush stress through the axle, wouldn’t it? Finally, I see lots of people removing the seat and leaving the seatpost in but extended. To me, that’s just asking for trouble, as the seatpost can act as a lever on the downtube. Either take it out entirely and secure it or remove the seat and put the seatpost down all the way. If that leaves anything over a few cms showing, I’d remove it. Hi Steve, thanks for your comment. I reckon they’re a good choice for protecting your bike, though they’re a shocker for agility, and if you need to be able to be able to pack it down, no joy there either. The plastic strut came with the bag and was used to cross brace the bag – I assume the manufacturer tested it to make sure the wheels wouldn’t be jeopardised! In any case, the bike and wheels were fine in that case – Melbourne->LA->Frankfurt->Toulouse->Frankfurt->Hong Kong->Melbourne. I agree re: your comment about removing the seatpost. It’s a trivial exercise to remove the entire post/seat compared to just the seat, so just take it out. One other option I have seen is to turn curved forks so they face to the rear/inside. This lessens the possibility that pressure will be put against them as a lever. Regarding straps slipping – many of these cheaper nylon buckles are more cosmetic than functional. I find it helps to take the slack and knot it back over the buckle to keep things from gradually slipping. In the past, I’ve simply dragged a cardboard bike box through the airport (most have nice smooth floors) but the lack of a decent handhold on the EVA pod is an issue. I am about to order mine and will see what I can retrofit to make it more manageable. Let us know how you go, Steve! Quick update – I’ve received my pod – I believe it is a Raleigh UK product but I bought it from an eBay seller (new) for GBP135 incl. delivery. Looks good. I’ve not had a chance to use it for travel yet, but can make some observations. The straps seem designed simply as handles, since they don’t cinch tightly and the heavy-duty zipper would be more than adequate by itself. Unfortunately, the plastic snap buckles on the straps are pretty flimsy and easy to inadvertently disconnect. Some wire twist-ties solved that. The front strap is even more handle-like and just a Velcro connection. As others have mentioned, there is no really good way to grab the pod to drag it along – the moulded-in handles on the case itself work but are not particularly ergonomic. I attached a web strap handle on the front, with an aluminium backing plate and that gives a good solid hand-hold. This will also be the best place for the airline luggage tag. Once I get the bike in it, I intend to cut some Styrofoam blocks to pad out the sides. My biggest fear is crush damage if the pod ends up under a bunch of luggage in an airplane hold – hence my wariness regarding the soft bike “bags”. More later. Hi Steve P. Good feedback. I continue to recommend the EVOC bike travel bag or the Scicon or the BikND Helium. Hey Aldwin, saw your email link to Amazon. I couldn’t answer you about a Trek fuel, sorry. Best bet is to get the BB to seat post measurement on fuel, then check the height/specs for the pod (which I don’t have to hand, sorry). That’s a 60cm road frame. In the background you can see the large foam “slab” that fits in the middle to keep the wheels from rubbing the frame. The wheels attach with skewers that were supplied. That’s good as the end caps protrude and they could get damaged – so no need to risk the good skewers. I pop-riveted on a real handle made from webbing with an aluminum backer for support – worked fine. I used a large block of styrofoam in the triangle to provide support against crushing. The RD was removed and cbale tied to the chainstay. Small parts went in a sealed bag and the leftover space was packed with bike clothes, shoes – etc. my weight limit was 23 kg/50 lb, so I could add quite a bit. The plastic snap buckles on my pod are pretty crap, so I used twisted wire to keep them together. The zipper is of very good quality, though, so the straps are more useful as handles, and I didn’t want them coming apart as some baggage handler was chucking the pod into or out of the airplane. Possible, but I don’t have this bike bag anymore so couldn’t measure for you, sorry. My case has made numerous trips O,sea,s by various users, Apart from the pulling issues its been fine. I have a large styrene base to fit chain ring in which seems to keep centre better, reduces toppling over.I undo bars from stem & fold them down between front forks, heaps of bubble wrap & or clothing etc between wheels, large flat washer on skewer shaft inside case to spread load. Have fitted castors with inside case support to allow easier handling. I have an OEM version of this. Wheeling it through an airport/train station or even a couple of hundred metres up a street to a hotel is fine. Even up short sets of stairs. A kilometre across rough ground with a strong crosswind is an exercise in expletives. The buckles do come undone when you just look sideways at them, though, so zip ties are used. The zip took some damage on one trip (luckily the trip home) so needed repair. Last trip the wheels both came out of the pod buckled, especially the front, so maybe a fully rigid case is my next purchase. EVERYTHING you could conceivably need to know about cycling in France. Prepaid France SIMs, taking your bike, Etape du Tour (and other sportives), campervanning France and loads more. 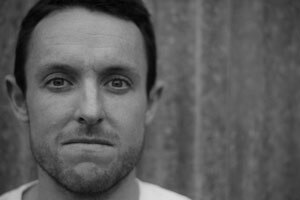 Founded by Tim Marsh, VeloNomad contains all the cycling holiday tips and tricks you’ll need, backed by thousands of hours of planning and execution experience. Learn about cycling nutrition, cycling training, Etape du Tour, other gran fondos and all the cycling product reviews. Learn more about VeloNomad here.